Celebrating the Class of 2017! 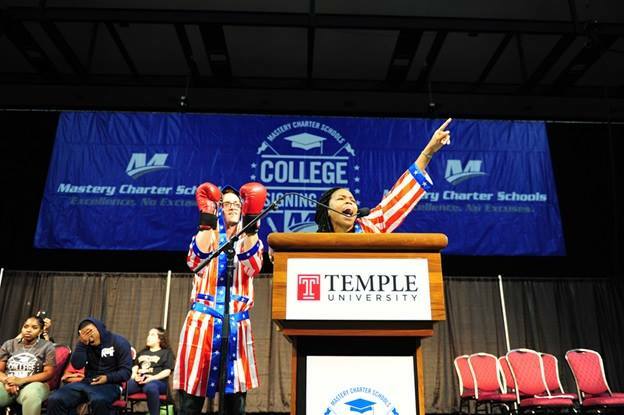 Yesterday, Mastery elementary and secondary schools came together at Temple University’s Liacouras Center to celebrate the Class of 2017. This year 695 seniors are graduating from Mastery high schools, earning over $22 million in scholarships and pursuing diverse postsecondary opportunities. During the event, Shoemaker Campus Principal Sharif El-Mekki was honored for his strong guidance and encouragement of students to pursue postsecondary options. The audience of Mastery staff, families and friends were treated to performances by Mastery choirs, drum lines and cheerleaders throughout the morning! Mastery Seniors Were Highlighted on CBS-Check It Out Here!